Warning! The following article contains spoilers for Love Live! Sunshine!! Season 2 Episode 1. If you don’t wish to be spoiled click away now! The autumn season is chucking at us two big idol shows this year, with both Love Live! and Wake Up, Girls! returning to give you your dose of idol-filled drama. I’m very interested in seeing which will come up on top over the course of the season and while I’m yet to get stuck into WUG, Love Live! Sunshine! !’s return makes it seems like it is going to be a good battle between the two. On face value there doesn’t seem to be that much going on in this opening episode, and in a lot of ways feels like a show starting off fresh. While taking basic knowledge of what happened in season 1 helps, it doesn’t matter so much if you haven’t watched it for a while or are jumping in blind as the way the episode is structured is geared towards reintroducing both the show’s overall concept and all the characters and their quirks. 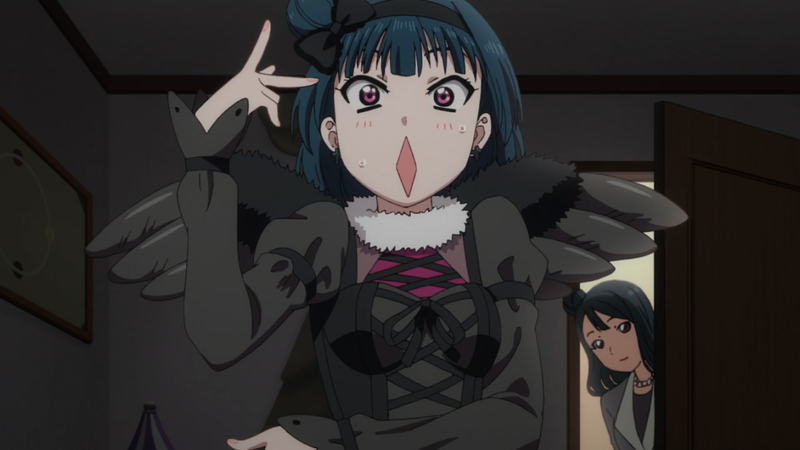 The gags revolving around Yoshiko and Mari are particularly hammered in at certain points, with Yoshiko correcting her name to her demonic alter-ego Yohane frequently, and Mari blasting out in English when she is feeling stressed. The imminent closure of the girls’ school is also quickly re-established, with Mari’s father taking the decision to shut the school for good and subsequently cancelling the school’s open day. This provides the main dose of drama where the shock of the finality of this decision hits the group hard. To be perfectly honest I’ve always been conflicted over the re-use of this concept from the original Love Live!, but it’s good to see that they are completely upping the stakes and giving us a different take on it. By now of course, μ’s already had this sorted by the beginning of the second season; and by taking a slower pace Sunshine!! works better at building the drama around it. So the crux of this episode then, is the girls finding the courage to go on even though they are facing defeat. 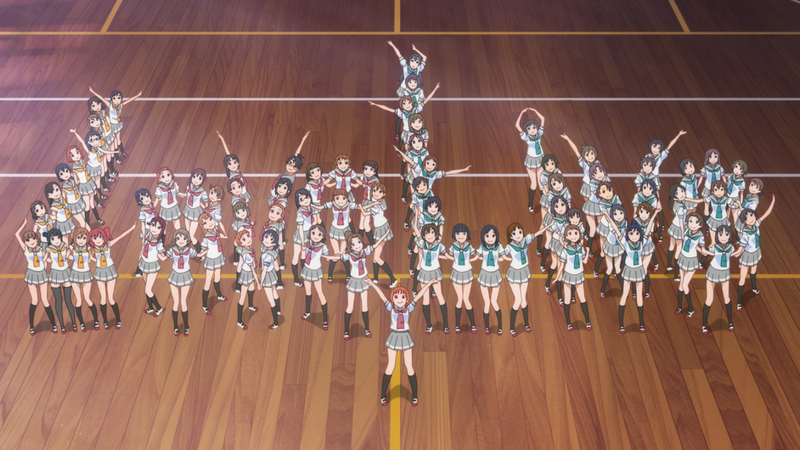 But if you look deeper there’s also hints of what may be to come as we hit off the back of season 1 where the girls realised that they didn’t have to be like μ’s at all. Which brings us to the question immediately posed – how can Aquors shine and stand out from all the other idol groups? Considering this is mentioned a couple of times I think it’s going to be something to watch out for in the background to see how they find the answer to that question. In terms of production value this episode is actually pretty impressive for the first episode of a returning show. 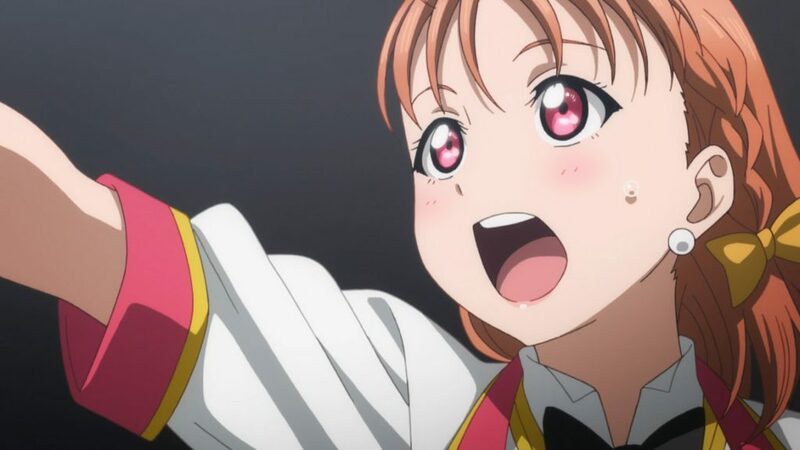 The visuals of course carry on being pretty fine with the same look and feel as we’ve come to expect from Love Live!, being a pretty cutesy show; but what always gets me is the extra level of detail that goes into it – particularly in close up shots where the lips are visible or when perspiration is literally dripping from Chika’s face. Then there’s the soundtrack, which is definitely bigger than I would expect for an opener – it’s often loud and in your face rather than sitting moodily in the background. I think it pulls it off best in the cheery impactful sequences at the beginning and end of the episode as it really works to push those emotions on to you. Again, impressive for a first episode of the season.